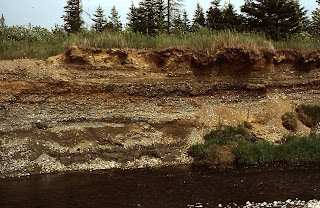 In my previous post in this series, I listed the three main types of placer gold deposits in Canada's southern Quebec Province. Again, these types are 1) glacial tills; 2) secondary glacial tills; and 3) non-glacial stream deposits. Based on geological research and past placer gold production figures, non-glacial stream deposits tend to hold the richest gold-bearing gravels and provide the best opportunities for small-scale miners. Please note the following fact though: the primary directional movement of glaciers in the region was from a northwest-to-southeast direction. Your best bet of finding decent placer gold values will be in non-glacial streams that were bisected by glacial movements (i.e., perpendicular to this movement and not parallel to it). Here's another tip for you...when working non-glacial stream bench or bar gravels, keep an eye out for gravels stained a rusty brown color. These pyritic (iron sulphide) gravels will hold the best placer gold values, bar none. By contrast, any coincidental, non-glacial gravels that show no iron staining like that just described will tend to be barren or will contain only widely scattered placer gold. Many of the non-glacial, auriferous streams in southern Quebec will have these "sterile" grayish colored gravels acting as overburden...so look for spots where erosion or stream action has exposed the rusty colored gravels and save yourself a bit of time and effort. 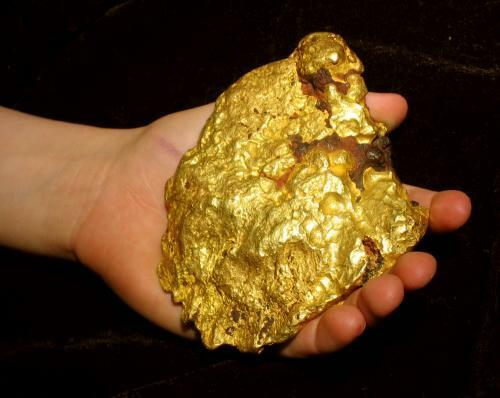 Although the great majority of the gold recovered in southern Quebec Province is of the fine or "flour" gold variety, some very large nuggets have been recovered as well. One of the largest weighed a whopping 71 troy ounces! As a specimen that nugget would probably be worth (at minimum) a half million US dollars or more. In addition to occasional large nuggets, much of the placer gold recovered in the past from southern Quebec was composed of smaller nuggets and large, irregular flakes. Additionally, large amounts of smaller flakes have been recovered along with the ever-present fine gold.